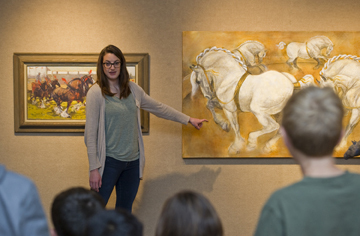 During school tours, students learn about art in the current exhibit, how to look at art, and how to read exhibit labeling. Tours are focused on an art theme that is well demonstrated in a few pieces of art in the exhibit. We suggest 30 minutes for a guided tour. Guided tours for school groups are $2 per student. Maximum group size is 40 students. $20 minimum tour fee. Scholarships are available for school groups. In addition to a guided tour of the museum, students can take part in a post-tour art lesson in our classroom. The art lesson reinforces the theme explored in the tour and gives students a hands-on opportunity to use this theme in their own work. The guided tour with art activity is approximately 90 minutes. Guided tours with lessons are $3 per student. Maximum group size is 40 students. $45 minimum tour fee. Scholarships are available for school groups. 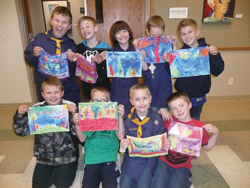 Art for Scouts is a new tour opportunity offered for Boy Scout and Girl Scout troops the first Tuesday of each month. Tours offer guided exhibit exploration and an opportunity for scouts to take part in hands-on art experiences. First Tuesday of each month, 4 – 5 pm. Please fill out the Tour Request Form and return it to artworks@theartmuseum.org. To schedule a tour by phone, please contact Liz Salisbury at 524-7777. All tours must be scheduled a minimum of two weeks in advance. We require one adult chaperone per 10 students. Admission is free for up to four chaperones. Additional adults accompanying the group are required to pay the $4 admission fee. Adults accompanied by additional children cannot be considered a chaperone and will be charged regular admission fees. Please use quiet voices during your museum visit. Please do not run or jump in the museum. 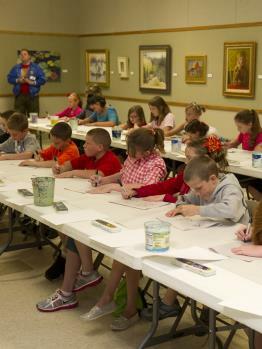 Students are under the supervision of the teachers and adults who bring them to the museum. If students do not follow museum rules, the group will be asked to leave. We do not allow drinks or food—including gum—in the galleries. ARTworks is also supported in part by awards from the William J. & Shirley A. Maeck Family Foundation; Helen Farrell; the The Post Register's Newspapers in Education; Fluor Idaho; INL through corporate funds from Battelle Energy Alliance; US Bancorp Foundation; The Ralph & Mary Lynn Hartwell Family Fund, The Gladys E. Langroise Advised Fund, and the F.M., Anne G., & Beverly B. Bistline Foundation in the Idaho Community Foundation. A tour opportunity for Boy Scout and Girl Scout troops. 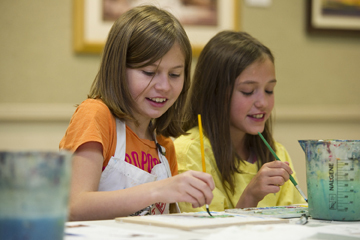 Tours include a guided exhibit exploration and a hands-on art lesson with a museum art instructor.